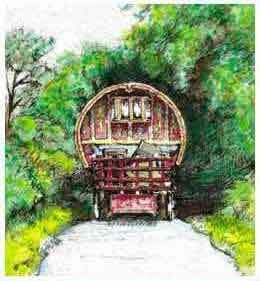 Gypsy Wagon or Caravan Ink and Watercolour Painting by Naj. "Persian Cat." 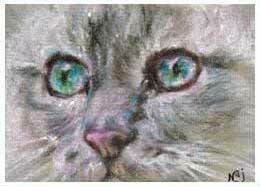 Miniature ACEO Cat Portrait Painting by Naj. "Lucky". 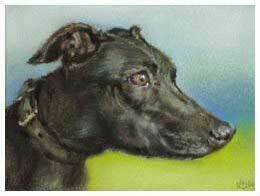 Dog Portrait Painting of a Lurcher. Original art by Norfolk based portrait and illustrative artist Naj. Commissions for artwork undertaken including portraits of people, pets, transport, and houses. Commission an original art piece and buy art direct from a UK independent artist : avoiding paying gallery mark-up costs means an original art work can be affordable art! In addition to original portrait art and illustration, Naj also undertakes custom canal art, which can be hand-painted to order. Miniature, often whimsical, original artworks, including Artist Card Editions and Originals (ACEOs), are available at auction / to purchase online from time to time, as well as larger format fine art paintings. Visit Depictions etsy store to buy art by Naj. Naj's Resources include further links to buy Naj's original art and art prints online. The portrait gallery showcases a selection of past fine art commissions, in a range of artists media, including artists pastels, colour pencils, watercolour and acrylic paints. Past fine art works include a diversity of subjects, for example, portrait work, a painting of a cottage and a Formula 1 racing car painting. Such subjects are not exclusive and commissions for art work and portraits, featuring most subjects will be considered. Pastel portrait paintings of people can be found on the Portrait Art page. For examples of horse paintings and equine artwork visit the horse art gallery page. Visit canal folk art to find out more about this decorative folk art painting. See examples of canal art - the traditional British folk art of narrow boats and canals where roses and castles are a recurrent theme. View barge ware past works and canal art commissions hand-painted by Naj. With some twenty years experience of producing commissioned artwork and portrait painting, and interests in ACEO art cards, in canal folk art and in web design & development why not find out more about the artist Naj. My Depictions is Naj's personal blog site (currently hosted with Blogger). It's the place for news about this web site, Naj's recent artwork and art news, plus tutorials and discussion about web design issues.